Covered with dirt from the excavation, I strive to make myself look presentable as a dust cloud in the distance signals the impending arrival of the director of antiquities and his entourage traveling in a caravan of white pickup trucks. As I bend down to retie my shoe, my eye is drawn to a rather strange looking potsherd. Only it isn’t a potsherd, it is my first epigraphic discovery; a fragment of a clay tablet written in the Neo-Assyrian script. For a cuneiform enthusiast there are few experiences more thrilling. 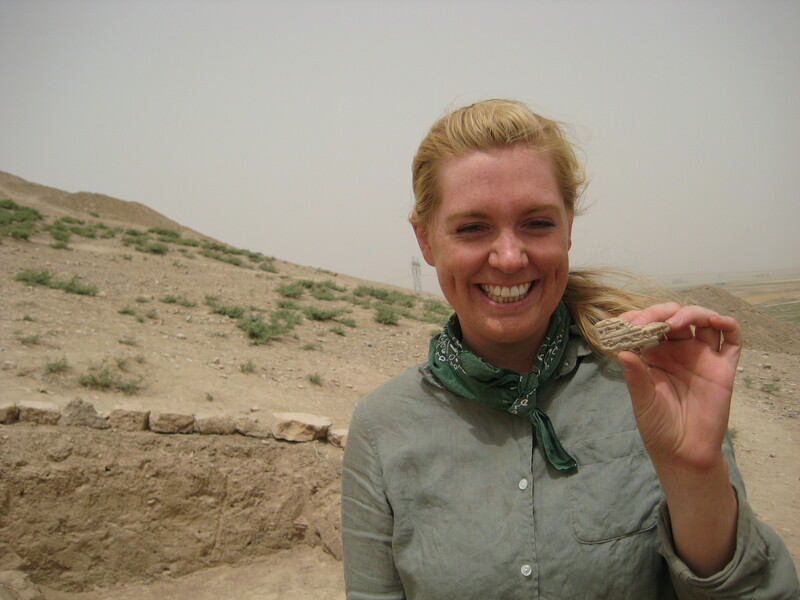 This occurred during my first field season at Qasr Shemamok in 2012, and I have had the incredibly good fortune to return for 2013 and 2014. My name is Katherine Burge and I am beginning my second year as a PhD student in the Art and Archaeology of the Mediterranean World graduate group at the University of Pennsylvania. Thanks to the generous support of the Penn Museum, I was able to participate in two archaeological projects in Iraqi Kurdistan this summer. 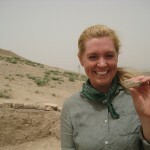 In addition to participating in the Rowanduz Archaeological Program, this support also allowed me to continue my participation in the French Archaeological Mission to Qasr Shemamok, directed by Professor Olivier Rouault (Université Lyon 2) and Professor Maria Grazia Masetti-Rouault (EPHE-Sorbonne). As in previous years, my participation in the project this season centered around an operation on the southern slope of the tell. 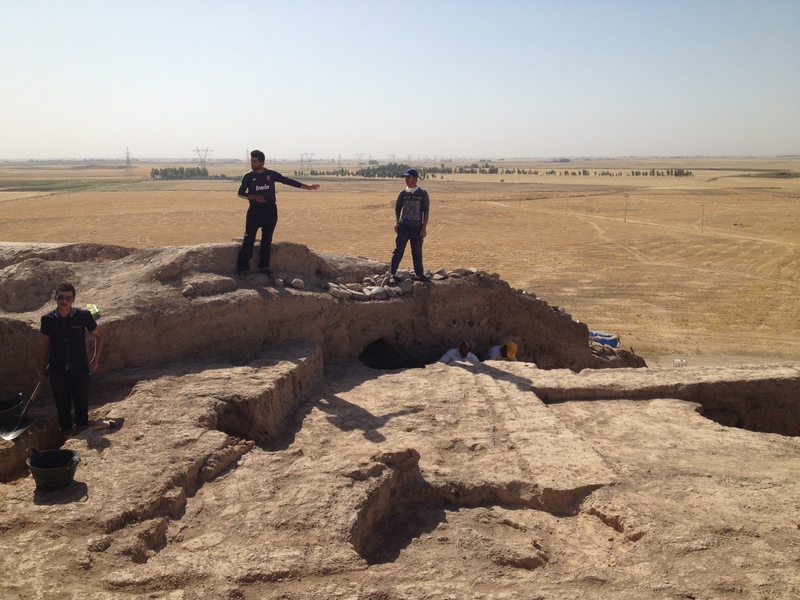 This operation began in 2011 as a step trench extending from the base of the tell to its surface, and has since been expanded to expose a series of occupations dating from the Middle Assyrian to the Parthian periods. 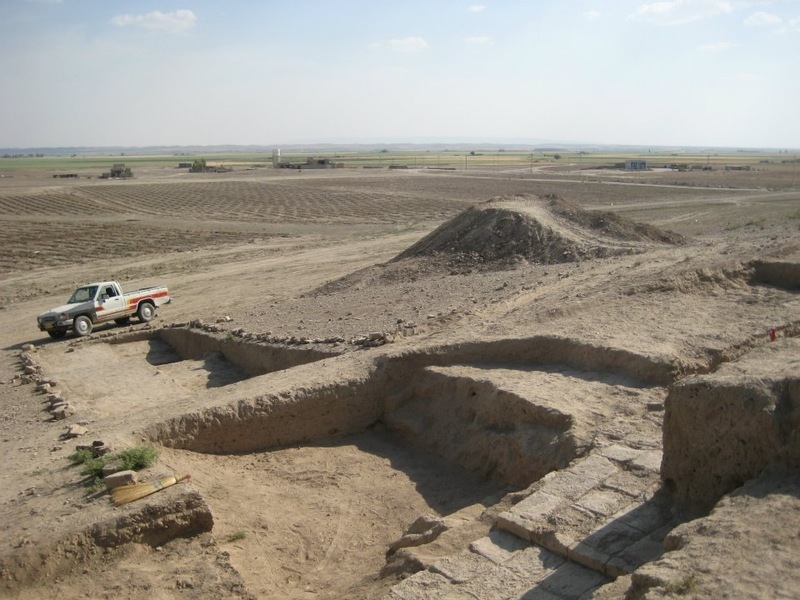 Last year’s excavation revealed a Hellenistic settlement cutting into the remains of an extensive mudbrick terrace dating to the Neo-Assyrian period, and it was a particular goal of this season to better understand this sequence. We therefore decided to open an area on the surface of the tell, in line with where we had been excavating on the slope. Just under the surface, we discovered a layer of fill and occupation, probably consecutive to a modern military function of the site. At a depth of around 80 cm, lines of mudbrick walls began to appear. These walls belong to buildings of the Parthian period, dated by the associated pottery. Excavating below the level of their foundations, we discovered a large layer of pebbles and gray sand, and showing traces of extensive culinary activity (fireplaces, ashes, animal bones, cooking pots, rocks and baked bricks organized as makeshift furniture, etc.) belonging to an earlier phase of Parthian construction. Under this layer we found mudbrick buildings and pottery dating to the Hellenistic period. This proved to be the northern extension of the settlement discovered on top of the Neo-Assyrian terrace last year. We further discovered that this terrace extends nearly to the top of the tell. I am especially thankful to have had the opportunity to return to Qasr Shemamok this year in light of recent events that may prevent my going back for a very long time. Recent months have seen the advance of ISIS into northern Iraq, and in the last week militants managed to penetrate Iraqi Kurdish border areas southwest of Erbil, taking the cities of Gwer and Makhmour. 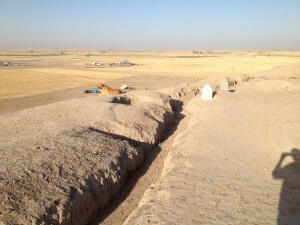 Friends in Erbil communicated to me that Qasr Shemamok, which is accessible from the road to Gwer, had also been taken. Fortunately, the area has since been reclaimed by the Kurdish military. Qasr Shemamok is no stranger to warfare. It has witnessed many military conflicts in modern times as well as during the ancient periods under archaeological study. Military trenches dating to the first Gulf War trace the perimeter of the tell’s surface where hoards of rusted artillery shells and even a plastic military map have been found. Cement floors from installations dating to the same conflict were discovered just under the surface layer in one of the excavation areas. The tell was also hit during the American bombing of the region in 2003, giving its surface a pockmarked appearance. 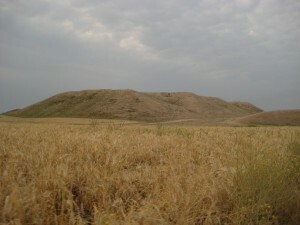 The modern name of the tell, Qasr Shemamok, probably refers to an Ottoman fortress, the ruins of which were noted by 19th century archaeologists A.H. Layard and Victor Place during their respective visits to the site. 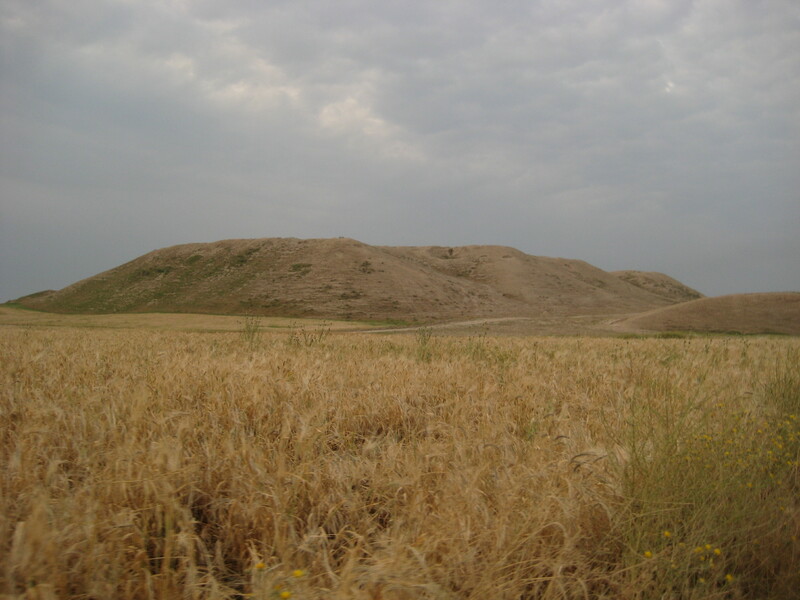 We know from inscribed bricks that the mound was heavily fortified by a double system of city walls during the reign of the Assyrian king Sennacherib. It is not difficult to see why the site has been so attractive for military occupations throughout history: at a height of 30 m, the tell provides a strategic vantage point from which one can see for miles across the Shemamok plain. However damage to the site during the present conflict is the least of our worries. Although the tell of Qasr Shemamok is currently unoccupied, there are two villages situated on either side of it. Several of the local inhabitants have worked with the French mission every season since the excavation began in 2011. We are anxious for the safety of these friends and coworkers, as well as for the safety of their families and neighbors.